Bright, rich & refreshing. Carefully chosen teas from Kenya and other origins blended for a smooth, rich and refreshing flavour. The teas we use are specially selected from the best tea growing regions of the world, each having a distinctive character and flavour. 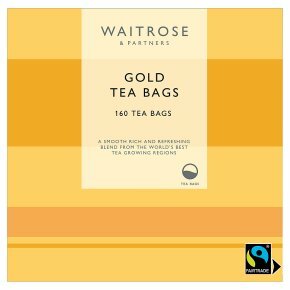 We have developed long term relationships with our tea growers to ensure that Waitrose offers the highest quality product. INGREDIENTS: Fairtrade Tea, kenya, Fairtrade Tea, East African. INSTRUCTIONS FOR USE. Use one teabag per person. Use only fresh drawn water, do not reboil. Pour water onto the teabag as soon as it boils. Stir immediately. Leave for 3 - 5 minutes, depending upon preferred strength. Add milk, if required.